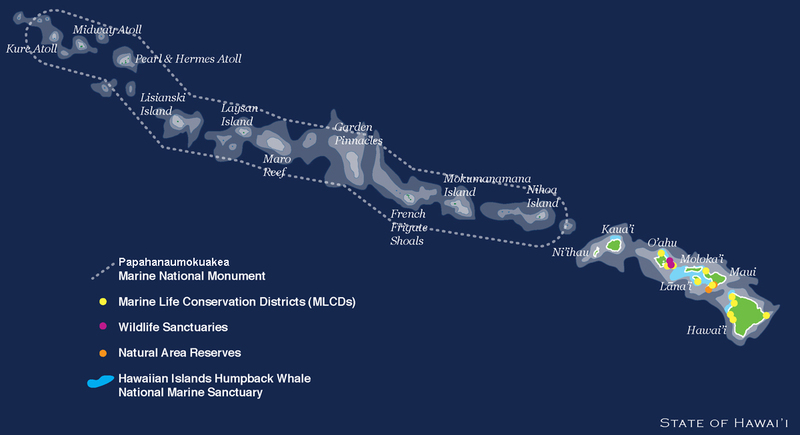 Papahānaumokuākea Marine National Monument is situated in the northwestern portion of the Hawaiian archipelago, located northwest of the island of Kaua‘i and the other main Hawaiian islands. A vast, remote, and largely uninhabited marine region, the Monument encompasses an area of approximately 139,797 sq mi (362,075 sq km) of the Pacific Ocean. Spanning a distance of about 1,200 miles (1,043 nm/1,931 km), the 115-mile-wide (100 nm/185.2 km) Monument is dotted with small islands, islets, reefs, shoals, submerged banks, and atolls that extend from subtropical latitudes to near the northern limit of coral reef development. 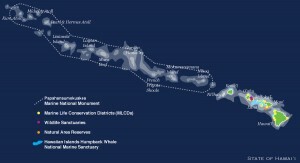 Presidential Proclamation 8031, issued by President George W. Bush on June 15, 2006, set aside the Northwestern Hawaiian Islands (NWHI) as the Papahānaumokuākea Marine National Monument, thereby creating one of the largest fully protected marine conservation areas in the world. This Monument designation added to the mo‘o kū‘auhau, or genealogy, of the NWHI, as a place of deep significance to kanaka ‘ōiwi (Native Hawaiians), and now, to the United States and the world. Management of the Monument is the responsibility of three co-trustees: the State of Hawai‘i; the US Department of the Interior, through the Fish and Wildlife Service (FWS); and the US Department of Commerce, through the National Oceanic and Atmospheric Administration (NOAA). The co-trustees are committed to preserving the ecological integrity of the Monument and perpetuation of the NWHI ecosystems, Native Hawaiian culture, and other historic resources. NOAA and FWS promulgated final regulations for the Monument under 50 CFR Part 404 on August 29, 2006. These regulations codify the scope and purpose, boundary, definitions, prohibitions, and regulated activities for managing the Monument. In addition, the co-trustees developed and signed a Memorandum of Agreement on December 8, 2006, to establish roles and responsibilities of coordinating bodies and mechanisms for managing the Monument. The Memorandum of Agreement also requires the co-trustees to develop a Monument Management Plan for ensuring the coordinated management of coral reef ecosystems and related marine environments, terrestrial resources, and cultural and historic resources of the Monument. To develop the Monument Management Plan, the co-trustees modified, as appropriate, the plan developed by NOAA’s National Marine Sanctuary Program through the public sanctuary designation process.